We have been providing Mobile Disco in Tewkesbury for 25 years for all types of special occasions and events. The most popular are Weddings, Birthdays, Anniversaries, Christenings and Work parties. When it comes to Birthday parties, we cater for all ages like the younger generation 16th, 18th and 21st where they like Chart music to the most mature parties. This may include 30th, 40th, 50th 60th, 70th extra and this is where the variety of music widens considerably. As a Multiservice company in Tewkesbury, we have achieved the following and still expanding every year. Below is a basic layout of the packages we provide in Tewkesbury. If you require more information, please look at our Disco Packages page. These have been the most popular packages over the last few years but we can provide a package to suit your own needs in Tewkesbury. 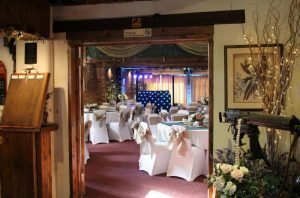 Package 1 – A quality Mobile Disco in Tewkesbury. Db Speaker System, Led black Booth, Tri Led Powerbar, Experienced Dj to suit your Ocassion and music till Midnight. Package 2 – Upgraded Mobile Disco in Tewkesbury with Uplighters. Full Range RCF Speakers, Martin Wizards, V2 Tri Led Booth, 4 Uplighters, Music for 5 hours and up to midnight. 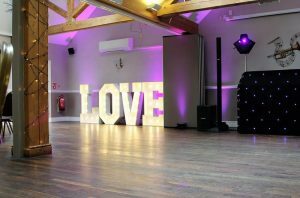 Package 3 – Our Most Popular Mobile Disco Package with Uplighters and Free Love Letters or Large Led Post Bost. 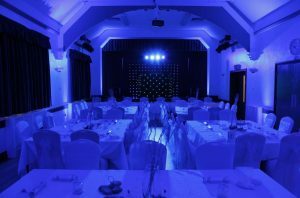 Package 4 – The Sparkle and Led Package with A quality Mobile Disco in Tewkesbury. Bose L1 and B2 Sub Array Sound System, Synced Martin Wizards, V2 Tri Multi Colour Led Booth, 8 uplighters to suit the colour of your theme, Evening Set up. Also with this package you can either have the Free love Letters or the 6FT High Led Post Box. Led Package also includes White Led Dance floor, Large white Led Backdrop for behind the Dj or Top Table. Package 5 – The Entertainment Package with Photo Booth and Large Mr and Mrs Letters.